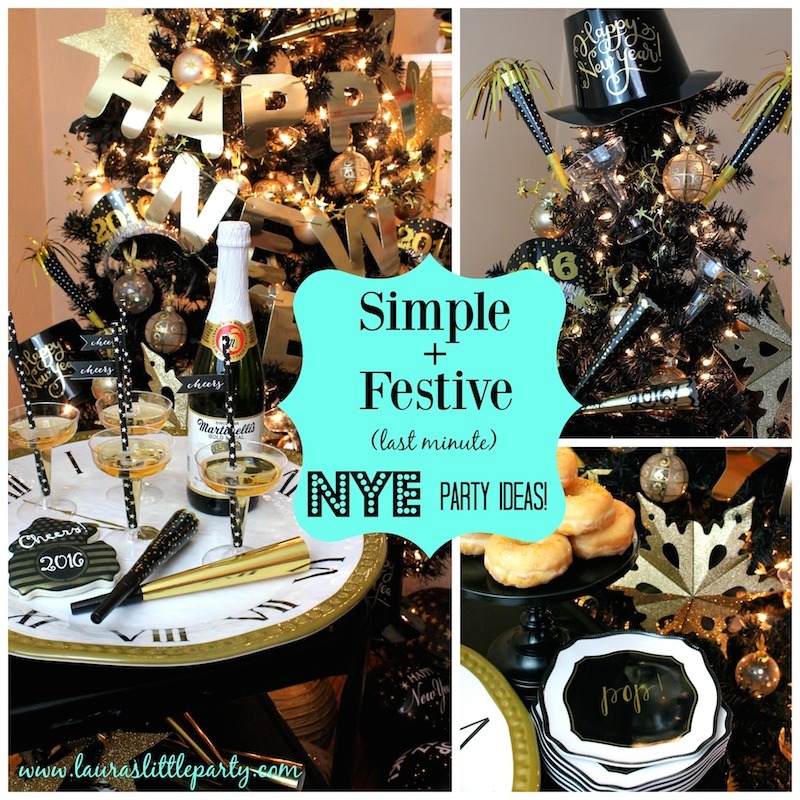 Simple New Year's Eve Party | NYE party inspiration! Are you celebrating New Year's Eve with lots of close friends? Family? Maybe a quiet evening at home? Either way you dice it, it's always fun to have a little "something" set up to ring in the new year! Party horns, hats, and a bubbly drink are easy ways to get in the party mood! Do you leave your Christmas decor up through New Year's? I took one of my Christmas trees and just added some fun NYE items to it. It turned out so festive! I'll be honest, this was much easier to decorate than my own Christmas tree. I added party hats & horns, (gold Christmas bulbs that were already on there), wired stars, a Happy New Year banner, and empty champagne glasses. Next, I brought over my drink cart. I love this thing! I use it all. the. time. They are so versatile, and they make any little set up look great! I added a large serving platter that I found at HomeGoods. I topped it with ready-to-enjoy sparkling cider, some festive cookies, darling serving plates (also from HomeGoods) and sweet + sparkly donuts! Aren't these gold sparkly donuts so fun?! They've been floating around out there for a while, but I just had to test them out for myself! I went to my local cake supply store and picked up gold disco dust, and Wilton shimmering stars edible glitter. Because the donuts were pretty goey, I just sprinkled the tops of the donuts to my desired sparkliness! Add them to a cute cake stand and you're set! I love decorating with balloons! No helium? No problem. Blow up some balloons and let them fall to the floor. Add a few paper lanterns, and you've got yourself some easy decor! My kids love to celebrate whenever possible. I love that this little set up is also family friendly. And because there isn't anything too grand or over-the-top about this party, you can easily put your own creative twist on it! However you celebrate the end of your 2015, I hope it's filled with lots of great memories & hopes for new accomplishments! Cheers, friends! This set up is fabulous!!! I LOVE your tree, such a great idea. I literally took off my Christmas ornaments and had no energy to take off lights or tree and BAM I saw this. So perfect for our NYE party!!!! Thank you!